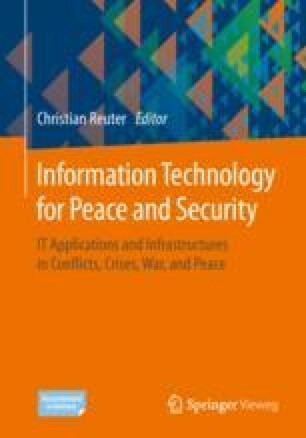 Dual-use in information technology is a pressing issue: how can we prevent, control or manage the risk of a harmful application of IT? How can dual-use awareness and regulation help to mitigate the risks to peace and security on the national and international level? As the cyberspace has been declared a military domain, IT is of increasing importance for civil and military infrastructures. How can researchers, developers and decision makers make sure that IT is not misused to cause harm? For nuclear, biological and chemical technologies this has been discussed as the dual-use problem. This chapter illustrates the approaches towards different dual-use concepts, how to conduct a technology assessment and provides insight into the implementation of dual-use assessment guidelines at TU Darmstadt, the so-called Civil Clause. Forge, J. (2010). A note on the definition of “dual use.” Science and Engineering Ethics, 16(1), 111–118. https://doi.org/10.1007/s11948-009-9159-9. Bezuidenhout, L. (2013). Data Sharing and Dual-Use Issues. Science and Engineering Ethics, 19(1), 83–92. https://doi.org/10.1007/s11948-011-9298-7. Carr, J. (2013). The misunderstood acronym: Why cyber weapons aren’t WMD. Bulletin of the Atomic Scientists, 69(5), 32–37. https://doi.org/10.1177/0096340213501373. DFG, & Leopoldina. Scientific Freedom and Scientific Responsibility: Recommendations for Handling Security-Relevant Research (2014). Retrieved from https://www.leopoldina.org/uploads/tx_leopublication/2014_06_DFG-Leopoldina_Scientific_Freedom_Responsibility_EN.pdf. Drew, T. W., & Mueller-Doblies, U. U. (2017). Dual use issues in research – A subject of increasing concern? Vaccine, 35(44), 5990–5994. https://doi.org/10.1016/j.vaccine.2017.07.109. European Commission. (2018a). Dual-use export controls. Retrieved from http://ec.europa.eu/trade/import-and-export-rules/export-from-eu/dual-use-controls/. European Commission. (2018b). Guidance Note - Research involving dual-use items. Brussels. Retrieved from http://ec.europa.eu/research/participants/data/ref/h2020/other/hi/guide_research-dualuse_en.pdf. European Commission. (2018c). Horizon 2020 Programme - Guidance How to complete your ethics self-assessment. Brussels. Retrieved from http://ec.europa.eu/research/participants/data/ref/h2020/grants_manual/hi/ethics/h2020_hi_ethics-self-assess_en.pdf. Leng, C. (2013). Die dunkle Seite: Informatik als Dual-Use-Technologie. Retrieved from https://link.springer.com/content/pdf/10.1007%2Fs00287-012-0675-7.pdf. Liebert, W., & Schmidt, J. C. (2010). Towards a prospective technology assessment: Challenges and requirements for technology assessment in the age of technoscience. Poiesis Und Praxis, 7(1), 99–116. https://doi.org/10.1007/s10202-010-0079-1. Lösch, A., Gammel, S., & Nordmann, A. (2008). Observieren – Sondieren – Regulieren: Zur gesellschaftlichen Einbettung nanotechnologischer Entwicklungsprozesse. Darmstadt. Retrieved from https://www.philosophie.tu-darmstadt.de/media/philosophie_nanobuero/pdf_2/observierensondierenregulieren.pdf. Meinrath, S. D., & Vitka, S. (2014). Crypto War II. Critical Studies in Media Communication, 31(2), 123–128. https://doi.org/10.1080/15295036.2014.921320. Müller, H. (2017). Challanges of Control. In EU Non-Proliferation Consortium ELearning. Retrieved from https://nonproliferation-elearning.eu/learningunits/arms-control-basics/transcripts/LU01_VL2.pdf. NATO. Warsaw Summit Communiqué (2016). Retrieved from https://www.nato.int/cps/en/natohq/official_texts_133169.htm. Oltmann, S. (2015). Dual use research: investigation across multiple science disciplines. Science and Engineering Ethics, 21(2), 327–341. https://doi.org/10.1007/s11948-014-9535-y. OpenTA. (2018). NTA-Mitglieder. Retrieved from https://www.openta.net/mitglieder. Owen, R., Macnaghten, P., & Stilgoe, J. (2012). Responsible research and innovation: From science in society to science for society, with society. Science and Public Policy, 39(6), 751–760. https://doi.org/10.1093/scipol/scs093. Resnik, D. B. (2009). What is “Dual Use” Research? A Response to Miller and Selgelid. Science and Engineering Ethics, 15(1), 3–5. https://doi.org/10.1007/s11948-008-9104-3. TAB. (2014). TA at the German Bundestag A brief history of the Office of Technology Assessment at the German Bundestag (TAB). Retrieved from http://www.tab-beim-bundestag.de/en/about-tab/history.html. TU Darmstadt. (2018). The Zivilklausel of TU Darmstadt. Retrieved from https://www.intern.tu-darmstadt.de/gremien/ethikkommisson/zivilklausel/zivilklausel.en.jsp. US National Research Council. (2006). Globalization, Biosecurity and the Future of the Life Sciences. Washington D.C. Retrieved from https://doi.org/10.17226/11567. von Massenbach, F. (2018). Initiative Hochschulen für den Frieden - Ja zur Zivilklausel. Retrieved from http://zivilklausel.de/index.php/impressum. von Schomberg, R. (2011). Introduction. In R. von Schomberg (Ed. ), Towards Responsible Research and Innovation in the Information and Communication Technologies and Security Technologies Fields (pp. 7–16). European Commission. Retrieved from http://ec.europa.eu/research/science-society/document_library/pdf_06/mep-rapport-2011_en.pdf. Wassenaar Arrangement Secretariat. (1996). The Wassenaar Arrangement on Export Controls for Conventional Arms and Dual-Use Goods and Technologies, (10). Retrieved from http://www.wassenaar.org. WHO. (2018). Dual Use Research of Concern (DURC). Retrieved from https://www.who.int/csr/durc/en/.